This can help anyone Say No To Alcohol and be alcohol free. Do you, or someone you love, have problems with alcohol? Are you afraid to admit it, but you think your partner is an alcoholic? 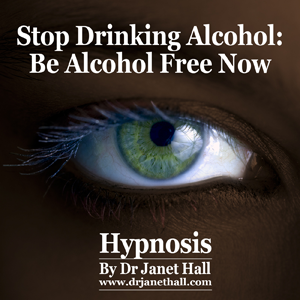 Dr Jan’s hypnosis can help anyone Say No To Alcohol and be alcohol free. Enjoy being healthy and proud of your decision to HAVE A HEALTHY BODY and HAPPY MIND forever. Make smart choices for your success. Be Successful and Be Proud that you save a lot of money every year and have so much more rewarding times on your hands. DR JAN’S “STOP DRINKING ALCOHOL” HYPNOSIS AUDIO IS THE RESULT OF MANY YEARS SUCCESS WITH CLIENTS. Dr Jan sees people on a one-to-one basis and has had a lot of success in dealing with those who need to stop drinking alcohol. This recording comes from Dr Jan’s clinical success with helping clients stop drinking alcohol. Going off with mates to get drunk. Drinking “to find that magical place”. Simply choose from the format dropdown when ordering below.